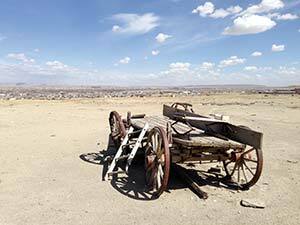 ABOVE: As the modern town of Shiprock sprawls in the background, an old wagon bears mute testimony to its farming legacy. 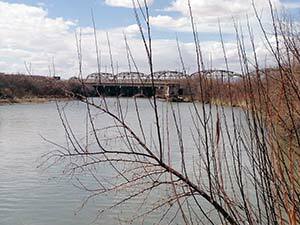 BELOW: Shiprock is one of just a handful of Navajo chapters graced with a year-round water source, the San Juan River. With 9,126 people at the last Census, Shiprock is the second-most-populous chapter on the Navajo Nation, but last Friday it didn't look like it. Everybody who could get a ride and a day off work was in Albuquerque cheering on the undefeated Lady Chieftains basketball team in the Class 3A tournament. Administrative Assistant Clarina Clark was left to man the chapter house, since having a niece who plays for rival Kirtland Central, she couldn't officially cheer on Shiprock High anyway. Even on this off day, however, there was a reception going on in the main hall of the chapter house, and people had come by to use the computers in the office. A quick look at the white-board calendar on the wall revealed an event penned in almost every day. Name - The chapter takes its name from the 1,583-foot-tall volcanic plug that can be seen from almost anywhere in the chapter. Shiprock, or Tse Bit'a'ii ("Rock with Wings") in Navajo, was the home of the Bird Monsters in the Dine creation story. Navajo names for this area include Naat'aanii Nez ("Tall Boss," referring to Indian Agent William Shelton) and To' Nii ("Off the Water"). Population - At 9,126, this is the second-most-populous Navajo chapter, just behind To' Nanees Dizi with 9,265. The town of Shiprock itself is considered the largest Navajo community. Land area - about 125,000 acres. Major clans - because people have been drawn here from all over the reservation, all the major clans are represented here. Assets - schools, including a branch of Dine College, a hospital, businesses, a performing arts center, the San Juan River, BIA and tribal offices. Issues - Crime, gangs, graffiti. Proximity to Farmington can be considered both an asset and a drawback. "It's hard to get people to shop locally," said the chapter's administrative assistant Clarina Clark, "with Walmart only 20 minutes away."